If you have been anywhere north of a line between the Severn and The Wash during this last week or so you can’t fail to have noticed that, day after day, this particular neck of the UK woods has been plagued by dreary grey skies, rain and generally cool weather, whilst to the south of that imaginary line there have been clear blue skies, blazing sunshine and record breaking temperatures. Our southern neighbours have been enjoying ice-creams, cold drinks, paddling, picnics, shorts and sun tops, Wimbledon, and all the other hot weather activities, while the rest of us could only watch from afar and wonder when some of it might be coming our way. The forecast for today was promising, no rain, light winds, sunshine, although the cloud would build later on in the day, and the temperature might even nudge up to 20 C.
That’ll do for us we thought, so off we went over to Honister to pay a long overdue visit to Kirk Fell and whatever else might take our fancy while we’re over there. 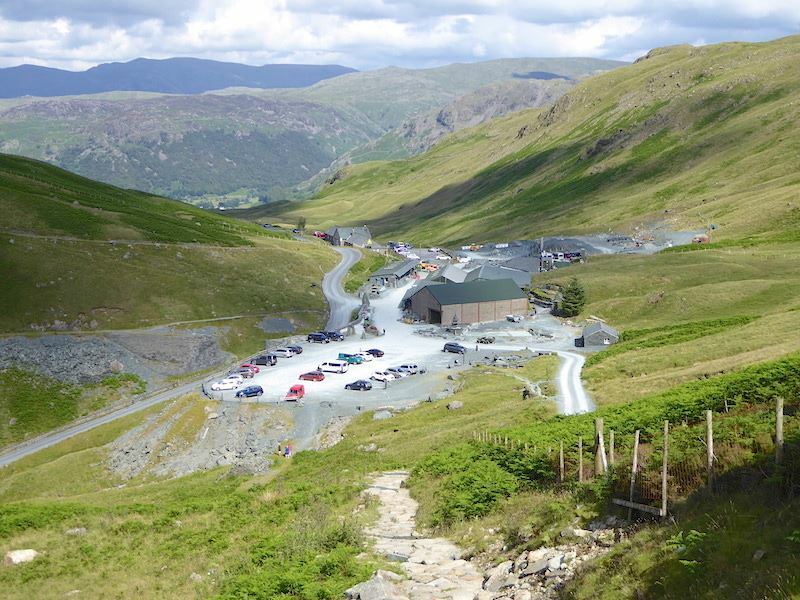 Its a beautiful sunny morning as we park up at the Honister slate mine and I take a look down the Honister Pass from the car park. 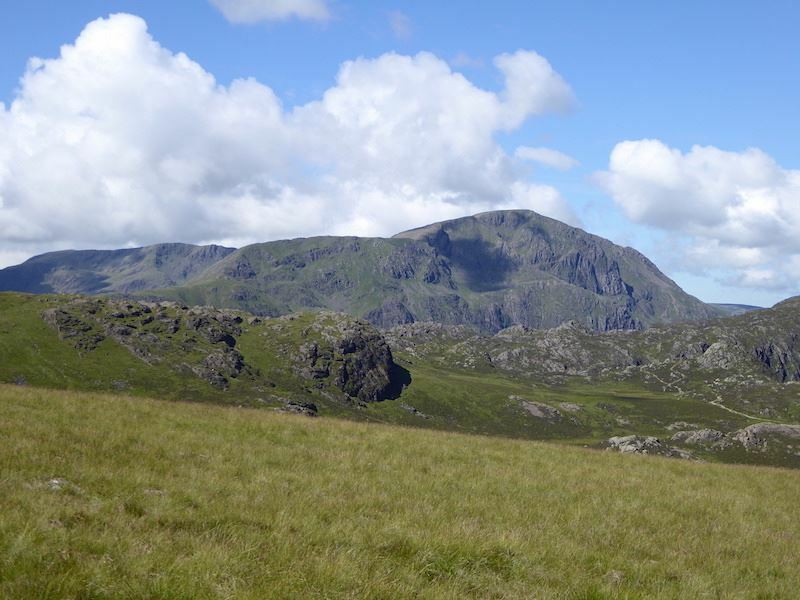 There’s barely a cloud in the sky with just the gentlest of breezes drifting over us as we, along with quite a few others, get our gear together in readiness for today’s walk. 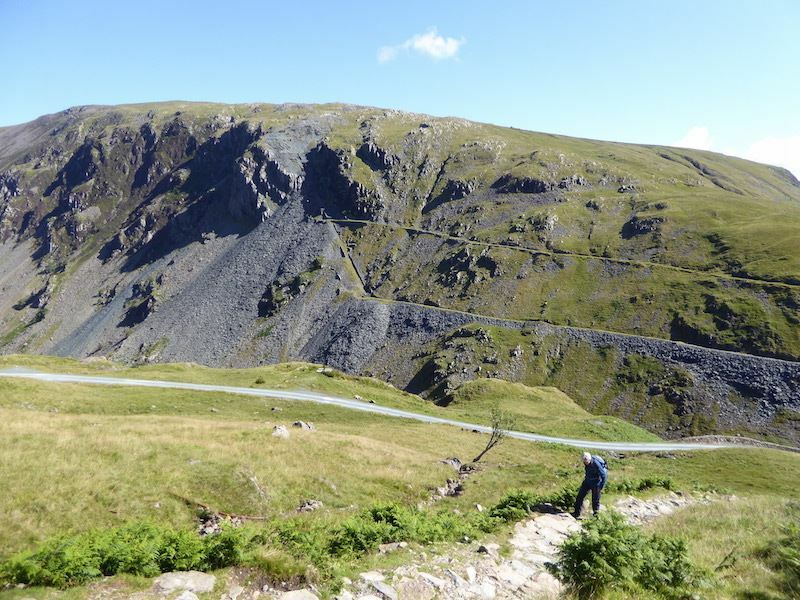 The path we are using today begins at the car park and we have a steady climb from there all the way up to the old winding house on flatter ground at the top of the incline. 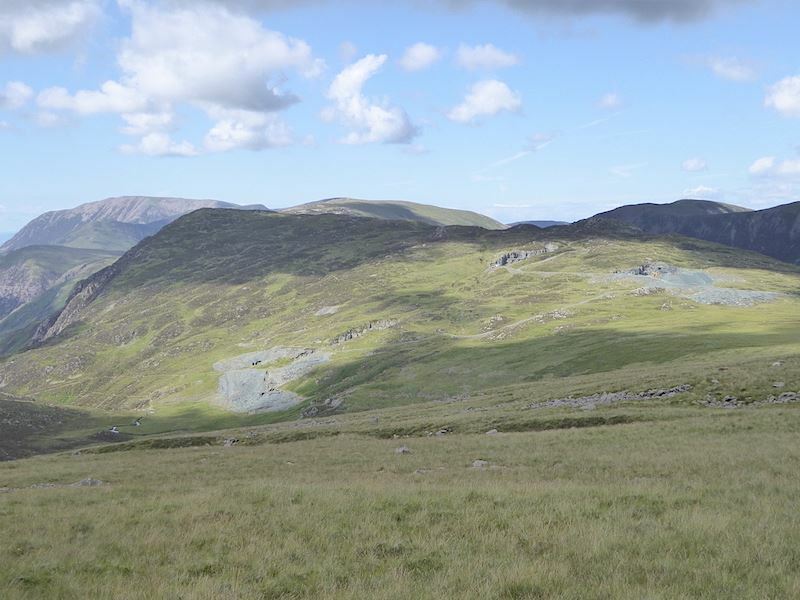 Opposite us across the pass are the deeply shadowed slopes of Dale Head clearly showing the evidence of all the mining activity which has taken place there over the years. 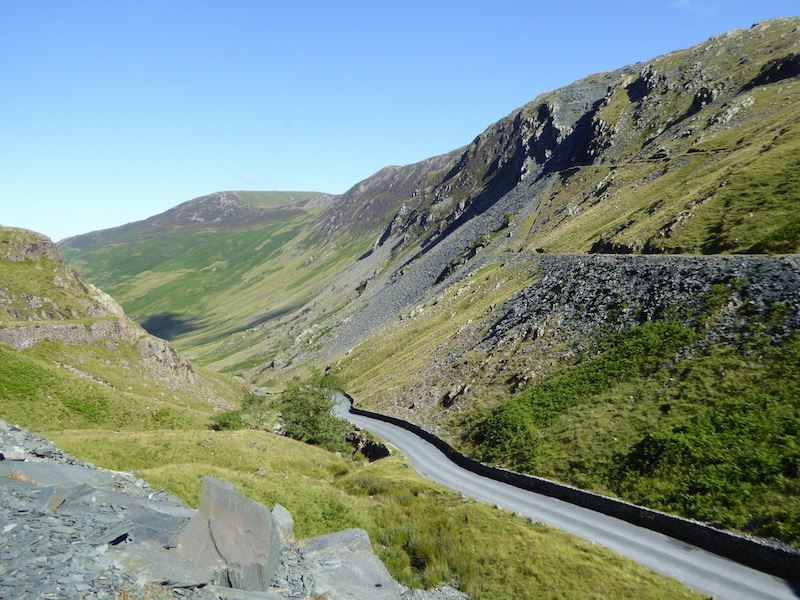 It wouldn’t be so bad on a day like today, but imagine being a slate miner walking, and working, across there when the snow was down and a gale force wind was hurtling up through the valley. Further up the path and there’s a narrow rock cutting to negotiate. It can become a bit of a bottleneck at times when the path is busy as there is really only room for one person at a time to comfortably pass through it. What remains of the old winding house at the top of the incline. Apparently the gps was telling us that from the car park up to this point we had climbed roughly 600′. 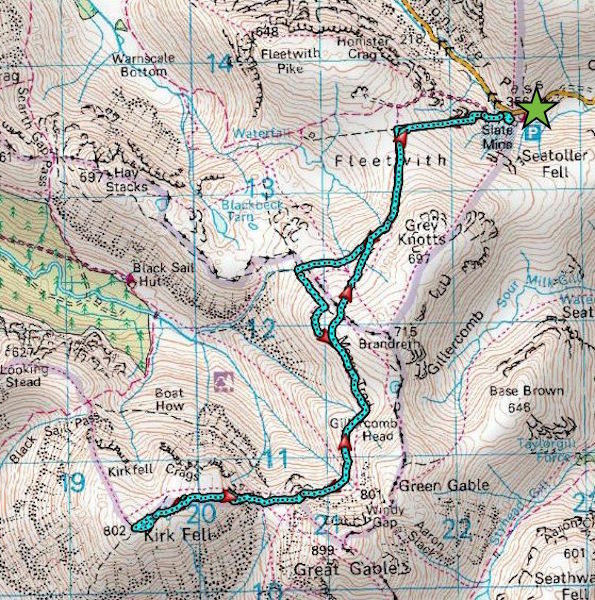 I didn’t need the gps to tell me that as I took off my pack and got out the towel for a spot of face and neck mopping. 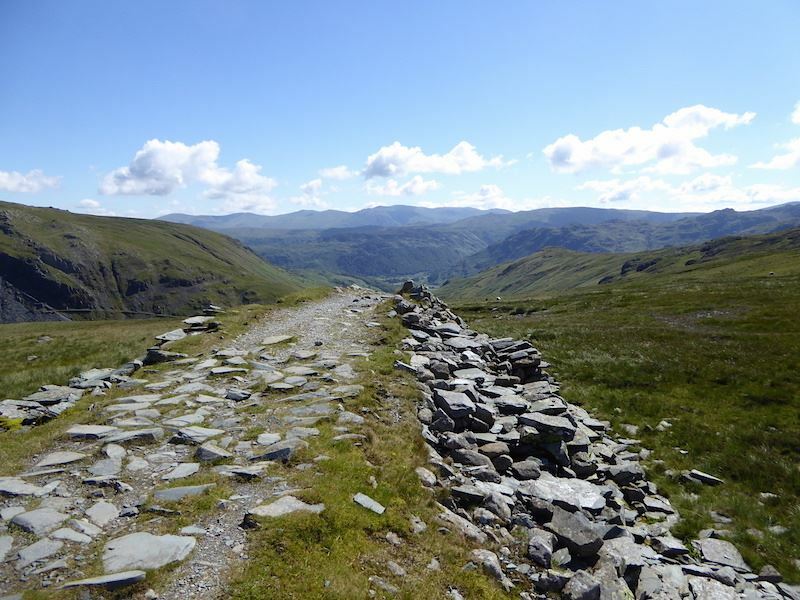 From the winding house we take the path which runs, at a much gentler incline, below Grey Knotts. Just as we were preparing to leave a couple came up alongside us with the guy jokingly asking me where the Cafe Nero was. I replied that there wasn’t one unless he’d brought his own, at which his wife told me that ‘he’ wouldn’t bring any because he didn’t want to carry it. So, if the person you are with won’t bring a flask of coffee because he doesn’t want to carry it, the answer is to get your own pack and put whatever you like in it. That would, of course, mean carrying it yourself though, wouldn’t it? He then said that they would follow us because we looked as though we knew where we were going. My reply was that where we were going might not be the same place they were going to which he said it didn’t matter because they didn’t know where they were going anyway. I couldn’t quite decide whether he was joking or not. 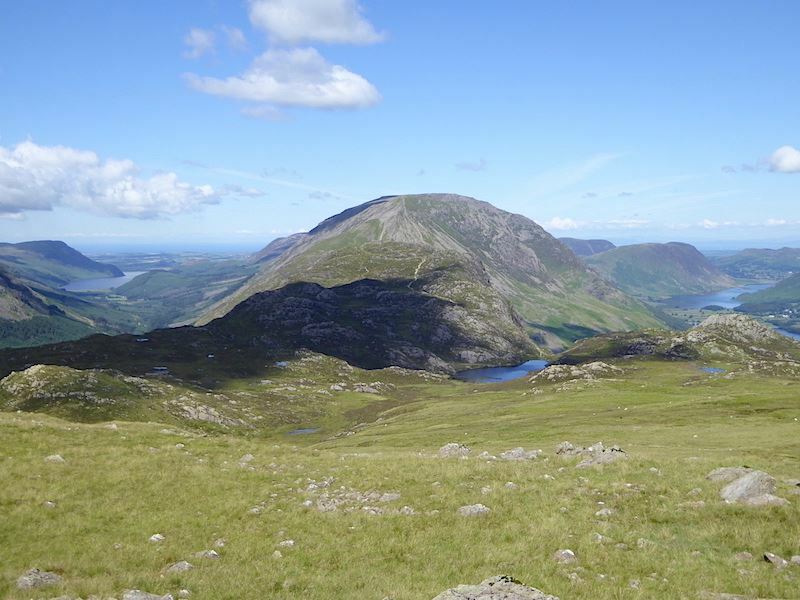 We carried on and the fells over to our right began to come into view with Pillar being the most prominent at the moment …..
….. further along and we get a good view of the craggy slopes of Haystacks …..
….. and then the scree strewn and heather clad faces of High Crag and High Stile. 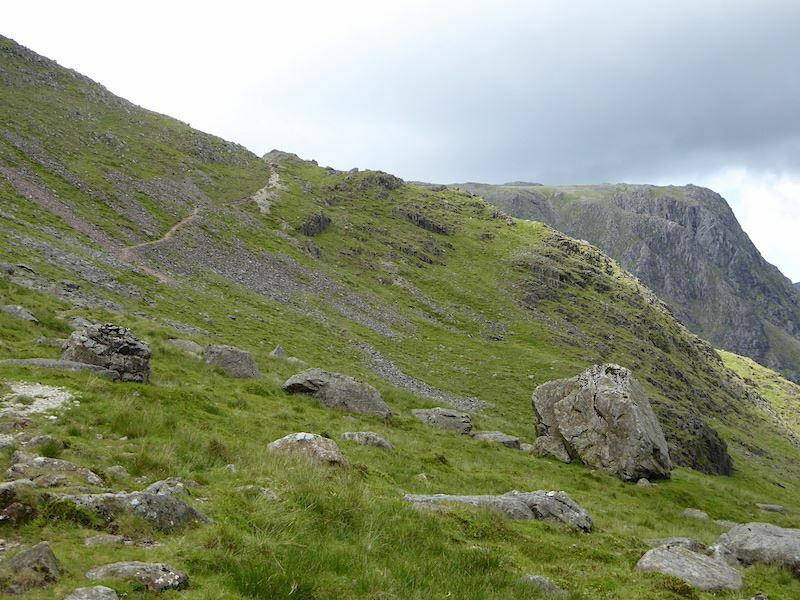 The paths on High Crag, on the left hand side of the shot, are as steep as they look and it doesn’t matter whether you are ascending or descending you will probably be ready for a five minute breather when you reach the end of them. I could hear voices behind me so I took a look back, thinking that it was the couple we had left at the winding house, only to find a large walking party making their way across. The couple were still at the winding house area, possibly deciding where to go next. 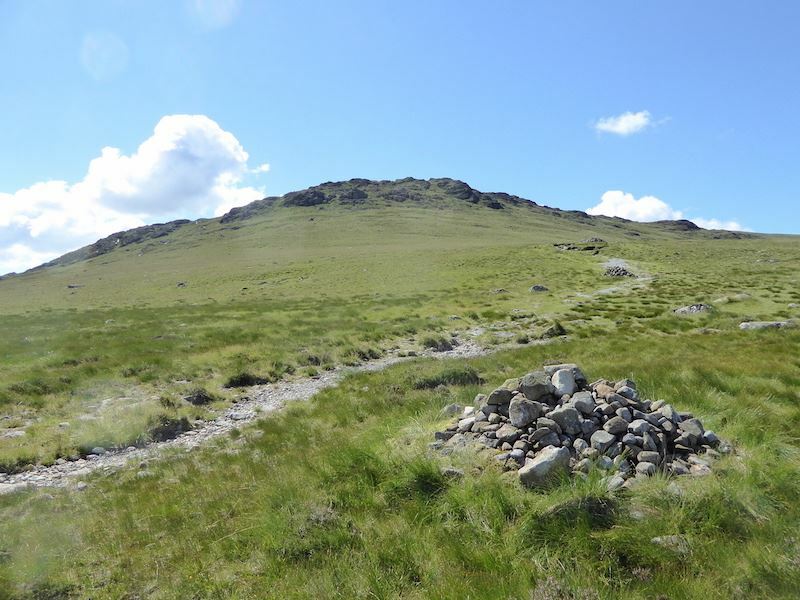 Further along the path, just below Grey Knotts, a large rock with horizontal quartz striations and topped with a large cairn, indicates a path junction off to the left. Both the left hand and right hand paths eventually meet but we kept to the lower right hand one as we like the views from this lower vantage point. 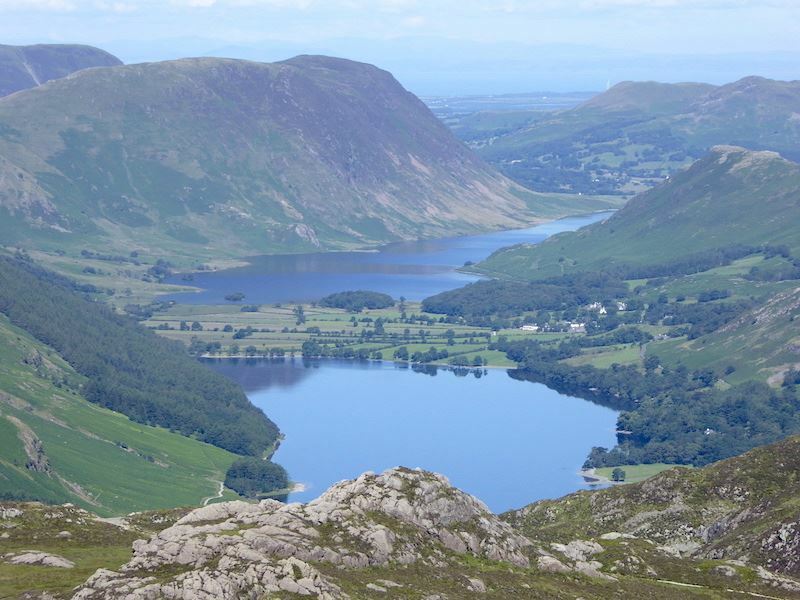 In this shot the waters of Buttermere and Crummock, with Mellbreak alongside it, are beginning to come into view. 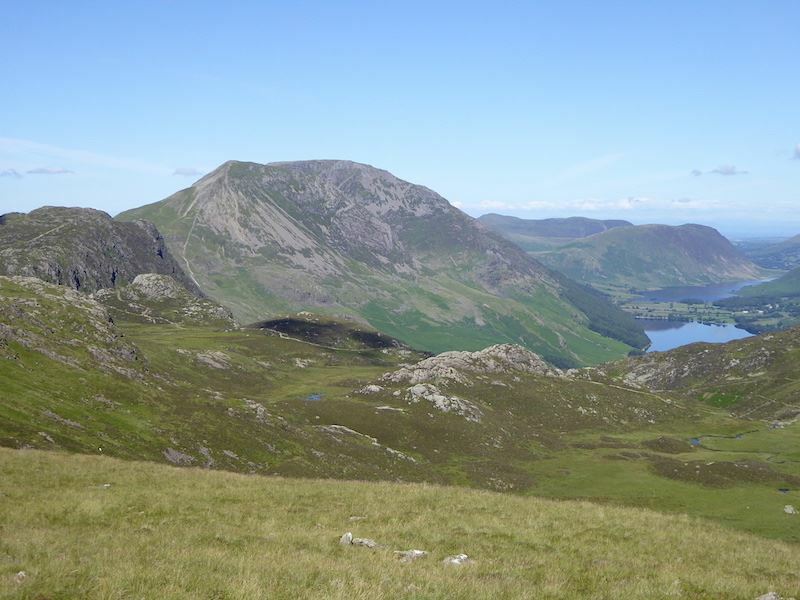 Looking straight along Buttermere and Crummock Water, with Mellbreak on the left of Crummock and Rannerdale Knotts on the right of it. 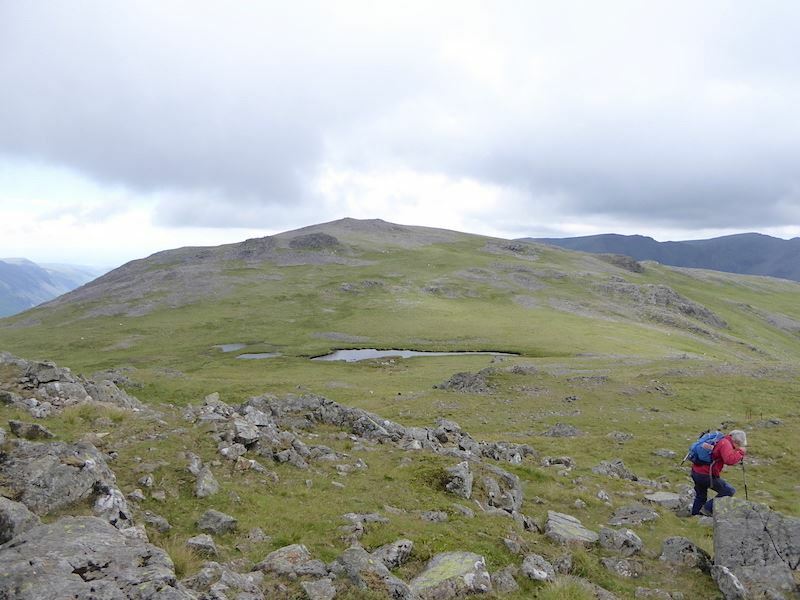 This is one of my favourite views, with Angle Tarn, below Angletarn Pikes, being number one on the list. 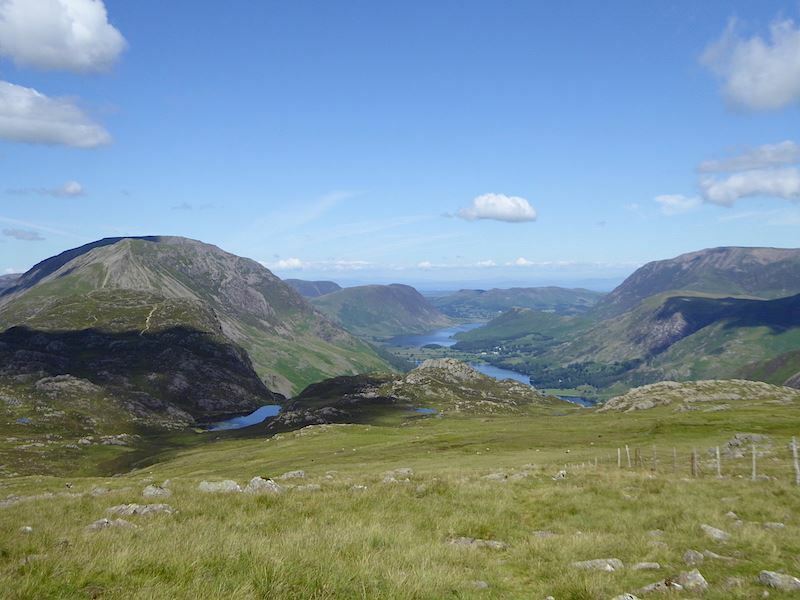 Over to the left of the previous view is this one so I took a close up of Ennerdale Water. 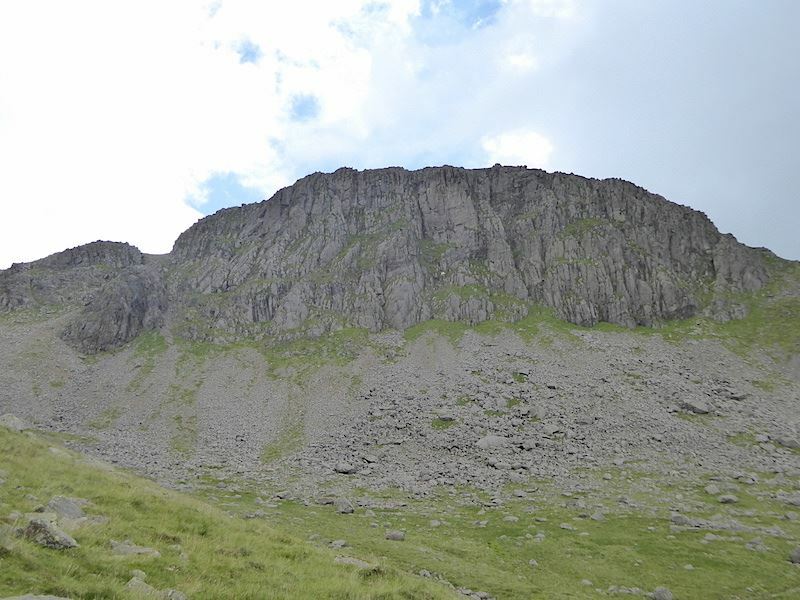 The headland jutting out into it is Angler’s Crag with Crag Fell rising up above it. 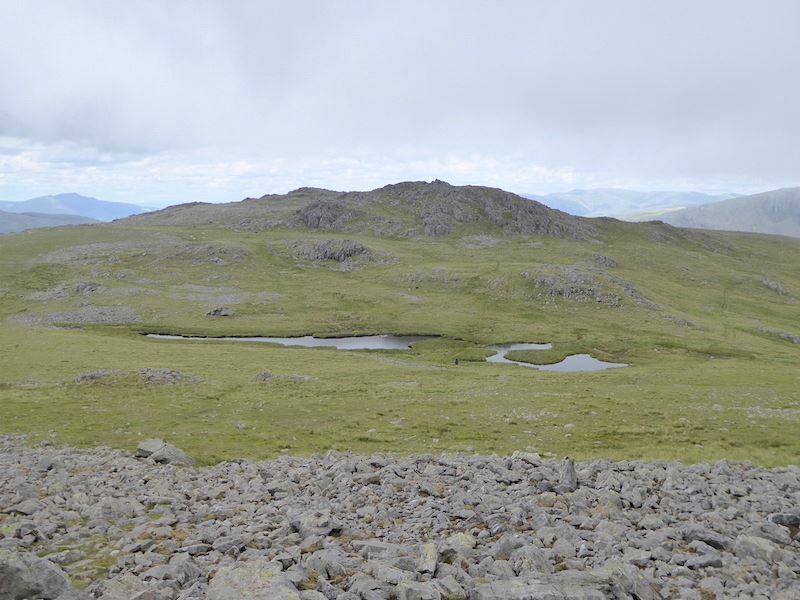 Here you can see both bodies of water separated by the High Stile ridge, with Blackbeck Tarn just to the right of centre. This is a Mars Bar stop par excellence so while it was being savoured here are a couple more shots …..
….. 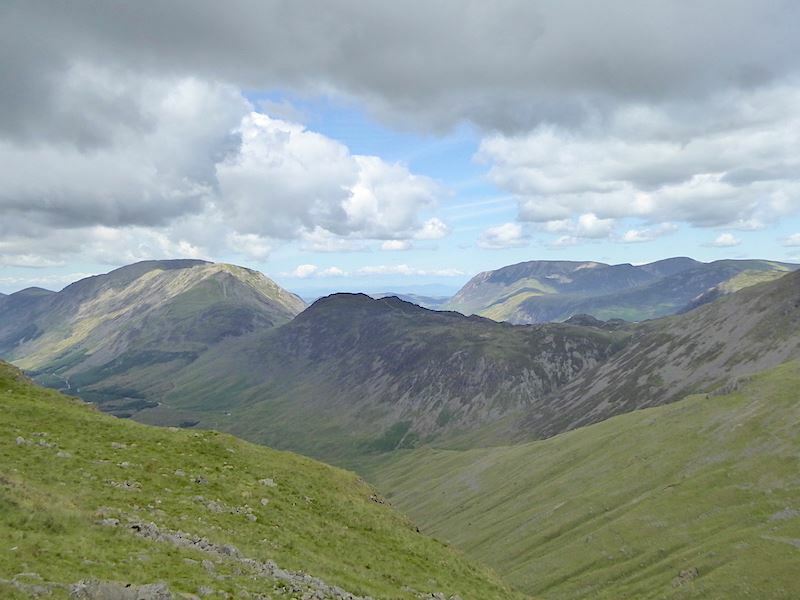 Pillar under a cloud …..
….. the Buttemere valley with the High Stile ridge on the left and the Grasmoor group on the right …..
….. and Ennerdale Water sandwiched between Pillar and the High Stile ridge. 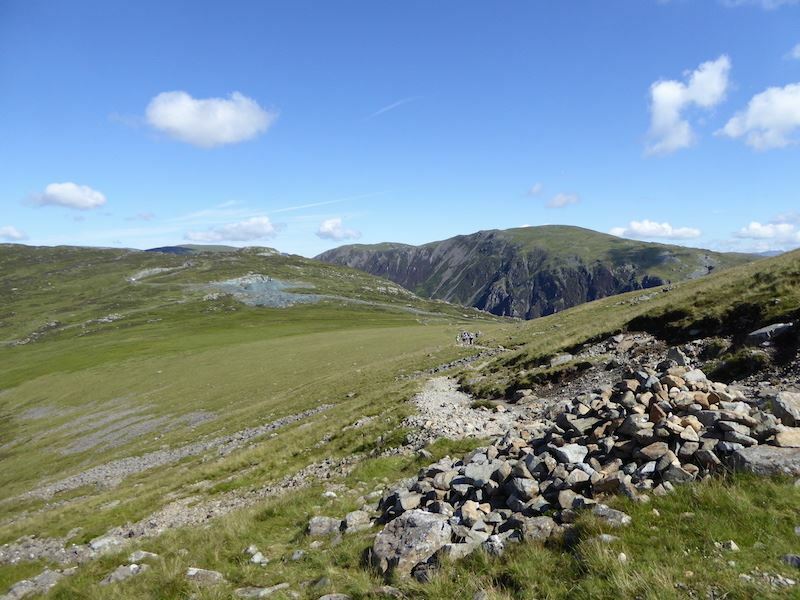 The Mars Bar and the views having been enjoyed we climb back up the hill to pick up the path which will lead us over towards …..
….. Green Gable and Great Gable. 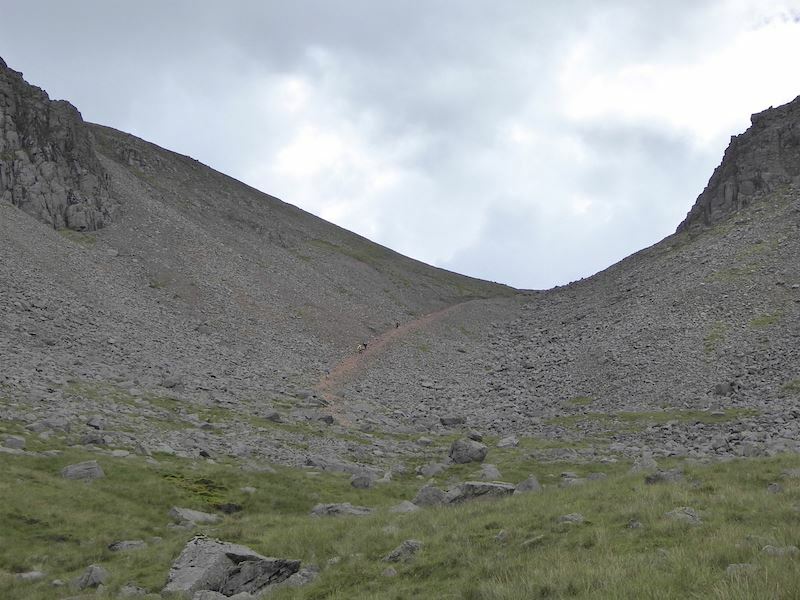 This is an enjoyable tramp over the lower slopes of Brandreth and which will eventually lead us over to …..
….. Beck Head, the U shaped gap between Great Gable and Kirk Fell. Unfortunately the forecast for a build up of cloud seems to be coming true so we aren’t seeing them in a very good light at the moment. 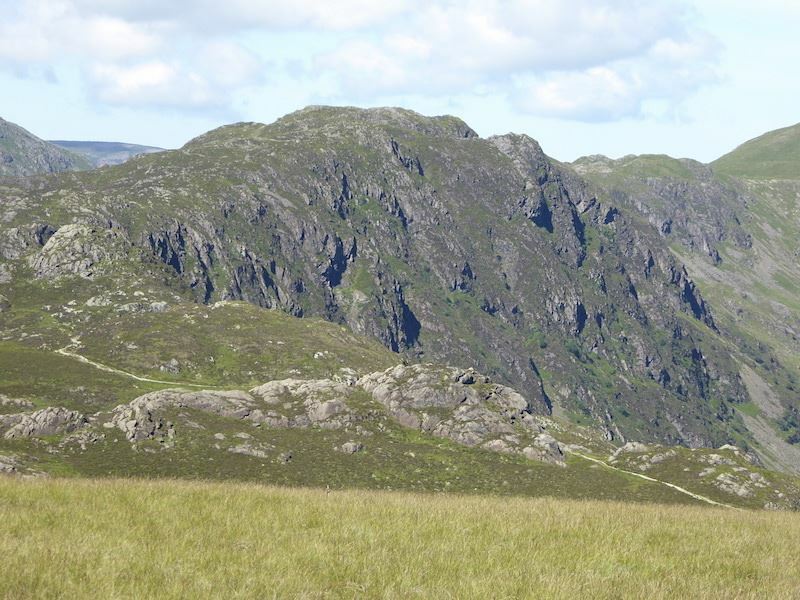 A look over to my right as we tramp across gives a view of Kirk Fell on the left and Pillar on the right. The cloud is playing havoc with the lighting and as its mostly blotting out the sun the temperature has dropped a couple of degrees and its nowhere near as warm as it was. I definitely do not need the brow mopping towel at the moment and considered adding another layer of clothing. I resisted, it is summer after all and it should be warm enough to walk at t-shirt level. 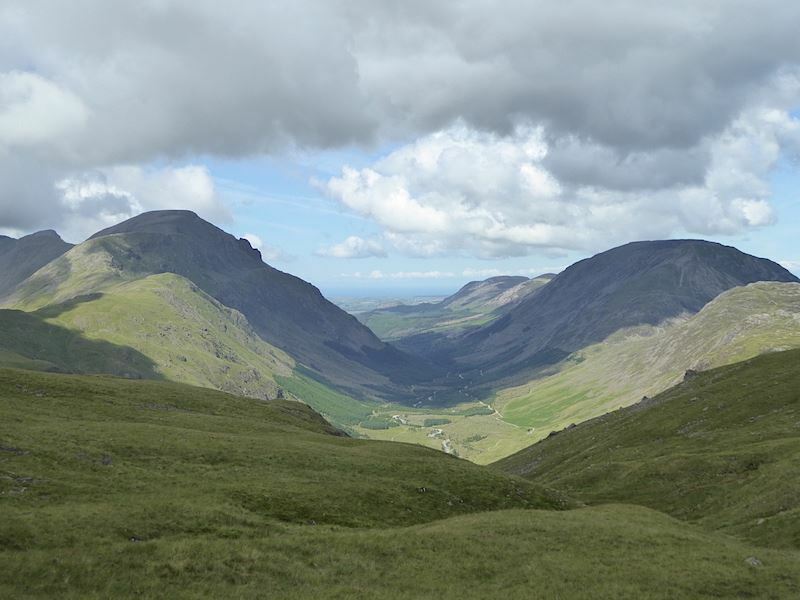 The view along Ennerdale as we approach the crossing at the bottom of Windy Gap …..
….. and the slightly different view of it as we cross Windy Gap. Looking up into Windy Gap. This is not an easy descent by any stretch of the imagination. 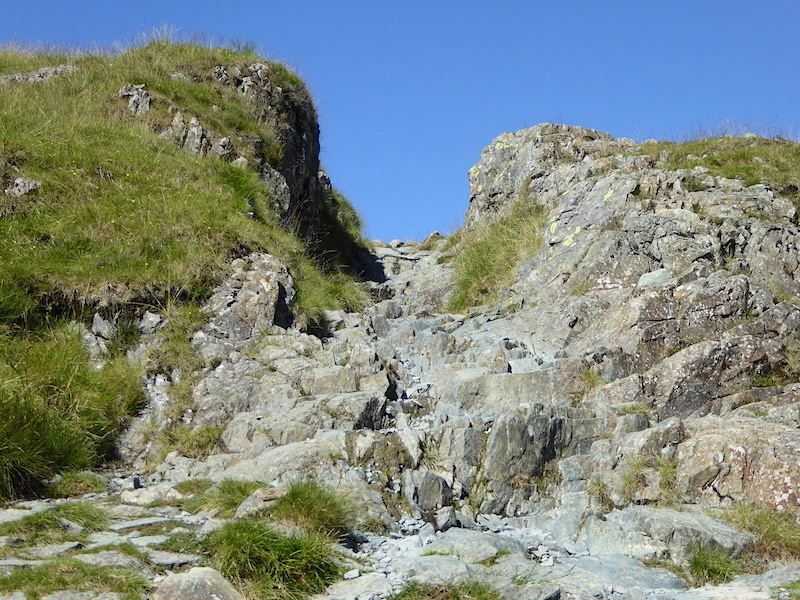 The path, if you can call it one, is simply a steep and well trodden deep slew of rocks and stones, where one misplaced step can result in a sudden and uncontrollable slide as the rocks roll away under your feet as quickly and easily as marbles. 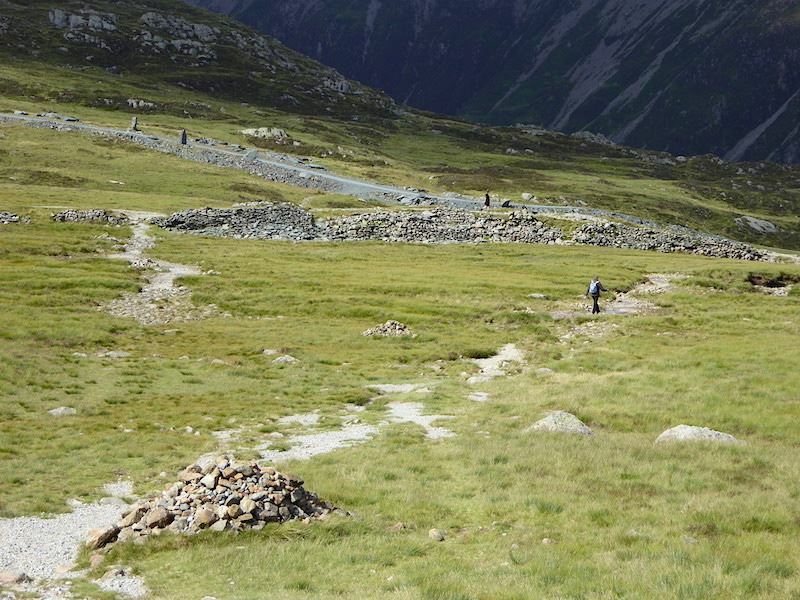 The walkers on it were descending very slowly and very carefully. 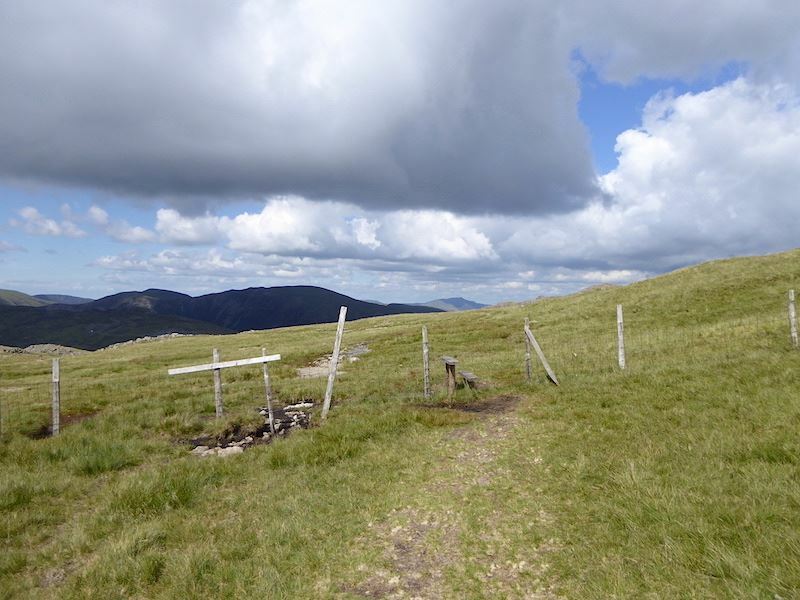 Across Windy Gap and we begin the climb along the path which will bring us out at Beck Head. We kept looking back and it wasn’t until we were about three-quarters of the way along that we saw that the walkers who were descending Windy Gap had reached the bottom of it safely and were sitting on some boulders taking a break, and presumably waiting for their legs to return to something like normal. 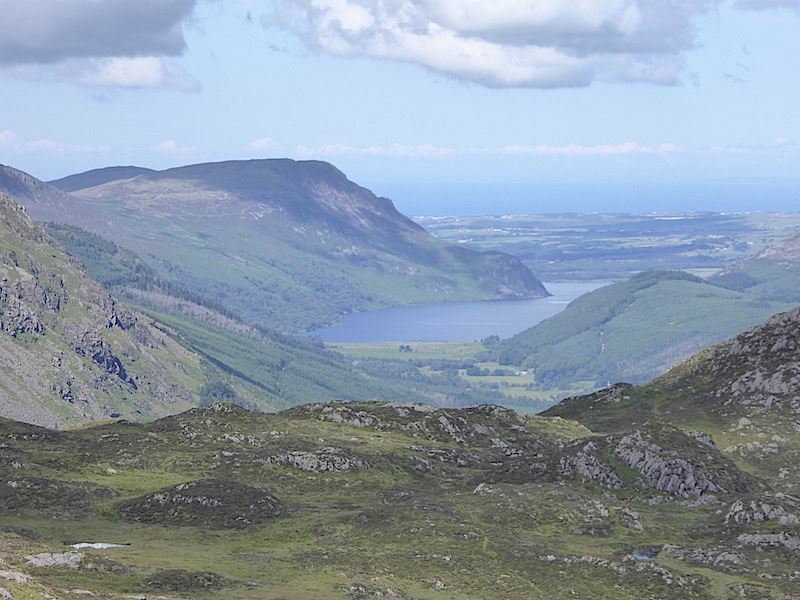 The lovely, if rather shaded, view across Ennerdale. 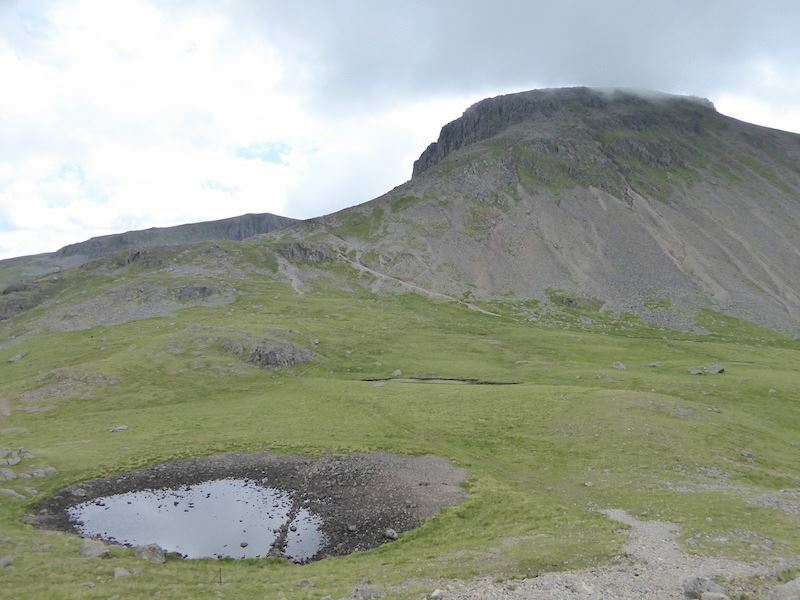 We reach the top of the path and below us is Beck Head, its tarns and the Rib End path up Kirk Fell. 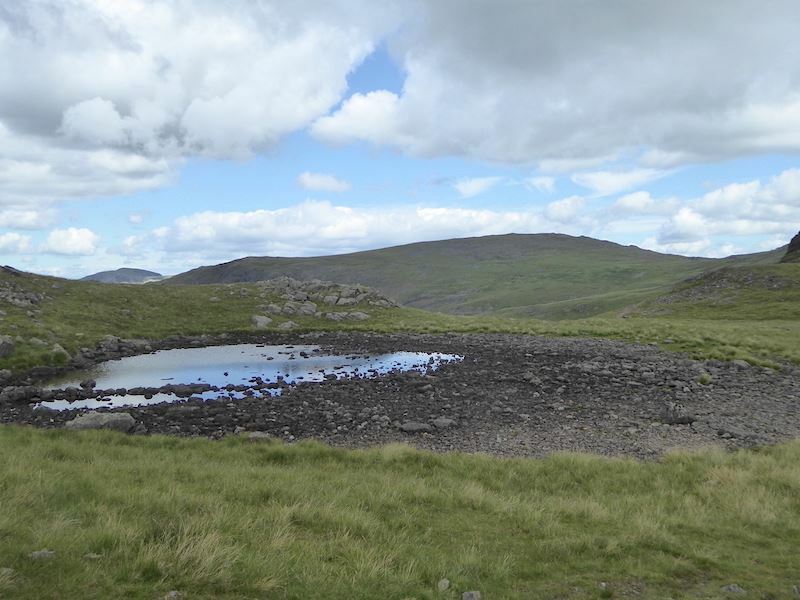 Down we go but before we begin the climb I take a look across the almost dry tarn over to Brandreth on the skyline beyond it. We are now under a very large cloud so the light has gone completely for the time being. It looks chilly and it was but, with a steep climb ahead of us, we decided not to bother adding a warmer layer. 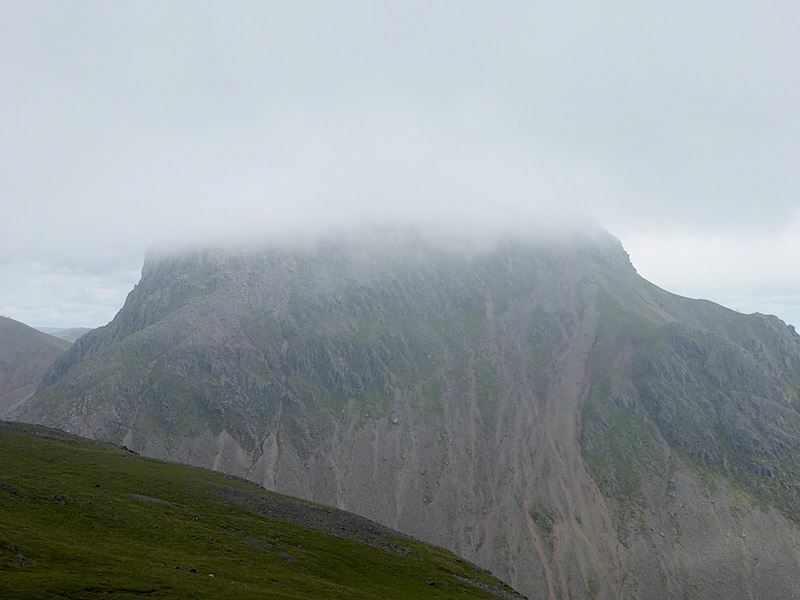 A quick look back at the wisps of cloud beginning to drift over Great Gable before the heavy lifting became serious. 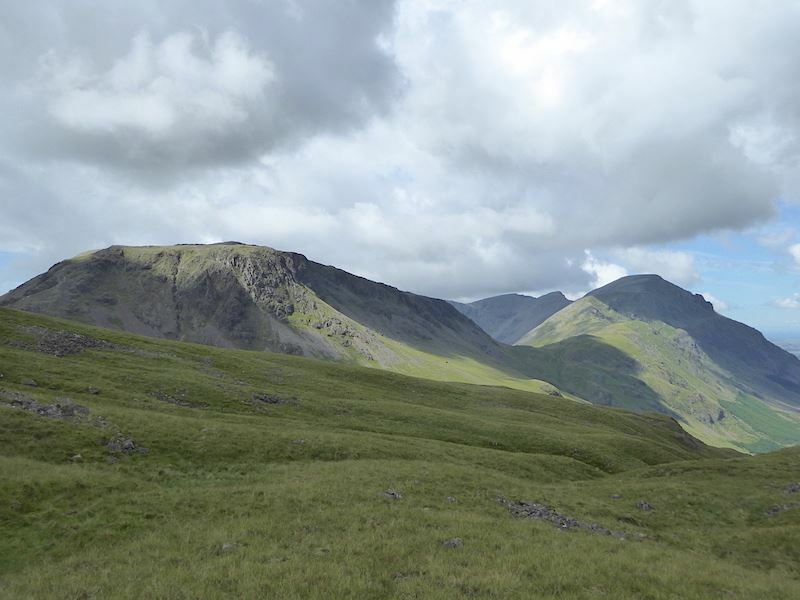 Another look back at Great Gable, with Green Gable on the left behind it, as we find a firm footing and take a pause for breath. 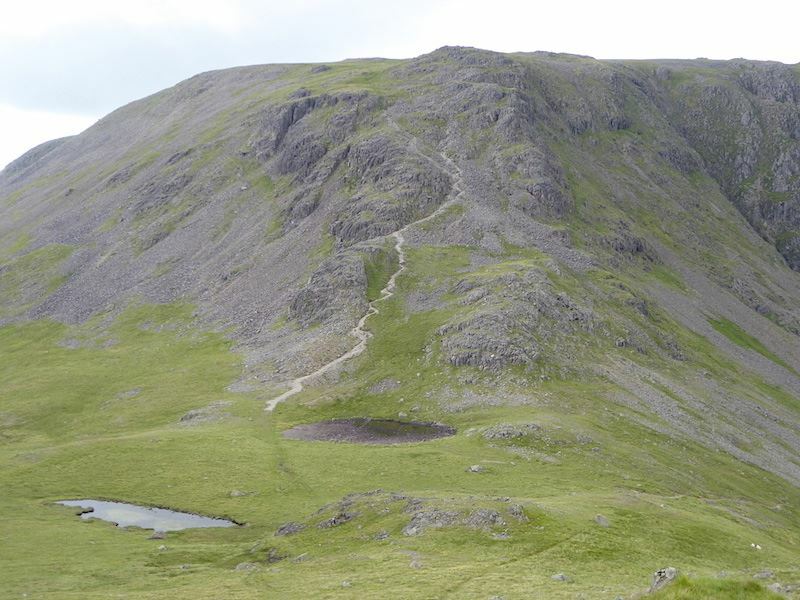 A variety of routes branch off from the main path which have been created by walkers trying to avoid its very loose rocks and stones. Whichever route you choose you come across sections where a handhold or three comes in useful, if only to be able to have something firm and solid to hold on to while your feet scrabble around for something stable to stand on. The camera went back in the case from this point on while I concentrated on the matter in hand. 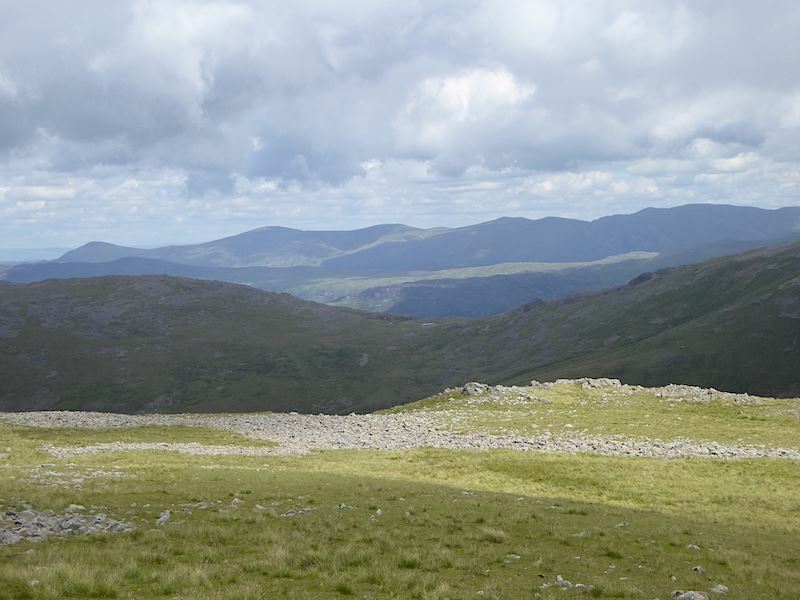 Looking across to the south top of Kirk Fell from its north top. When we reached the north top it was definitely time to add a couple more layers. We were hot from the climb but, as we were under another huge cloud and the breeze was now on the chilly side, we knew that heat would soon dissipate so on went the long sleeved mid layers and the windproofs. Since we had stopped to do that we also decided it might be a good time to take a break, have a bite to eat and wash it down with a couple of cups of hot coffee. As the hot liquid spread its warmth through us I thought about the chap and his Cafe Nero back at the winding house. It might be a pain to have to carry it, and we did think about not bothering with it today as it was such a sunny morning when we were packing up, but right at this moment huddling in the shelter of the north top’s rocks in a cool breeze and beneath some heavy cloud I was so pleased we had brought some with us. Refreshed and ready to go again we set off down from the north top and make the short crossing over to the south one. 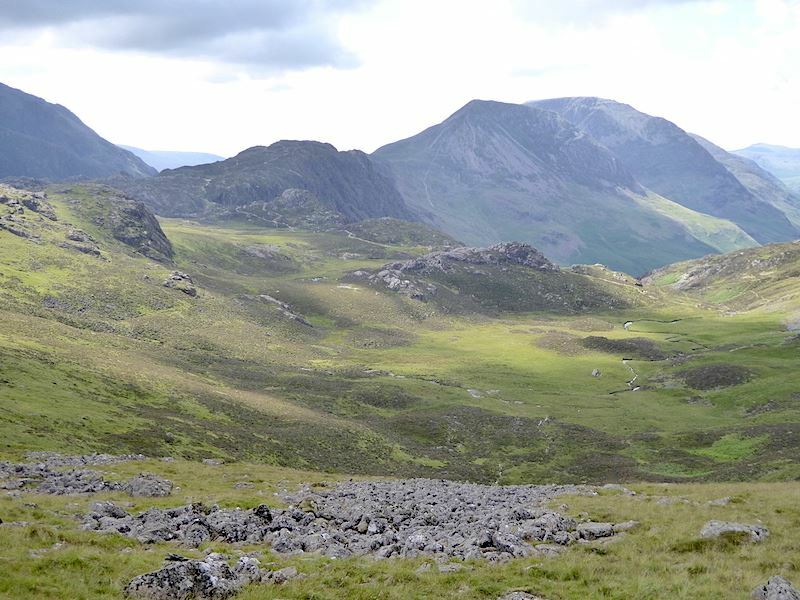 A look back to the north top as we pick our way across the rock strewn area just below the south top. 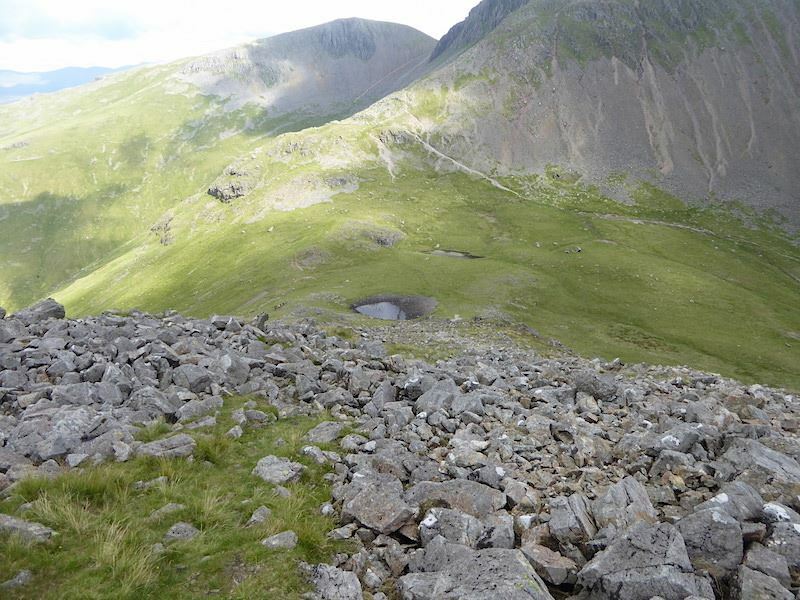 If you zoom in you might be able to pick out the little black shape of another walker just in front of the tarn. “It was supposed to be sunny today,” he shouted across to us as we passed each other at about a hundred yards distance. “What’s the forecast for tomorrow?” “Pretty much the same as today,” we yelled back. “OK thanks, have a nice day,” he shouted back. Fell walking conversations can be very varied indeed. 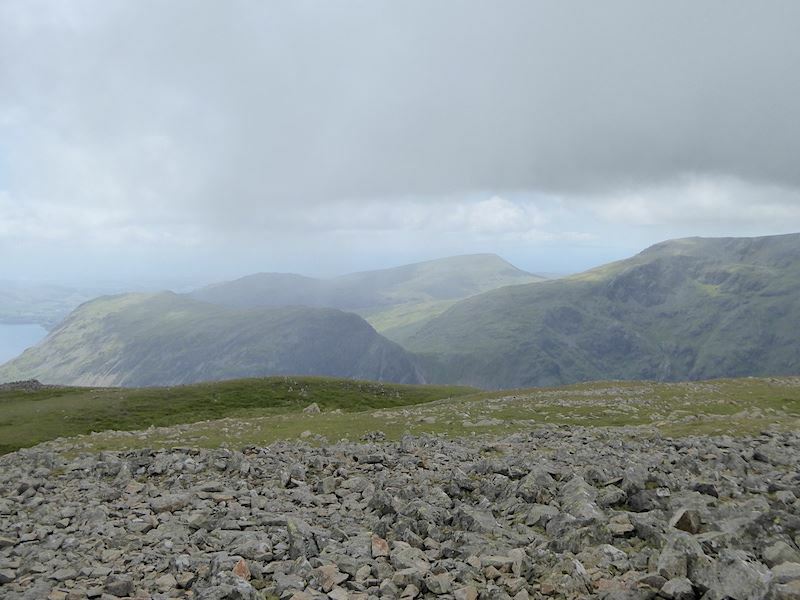 Now we’re on the south top so its a chance to take in the views only, thanks to the low cloud. there isn’t much on offer. 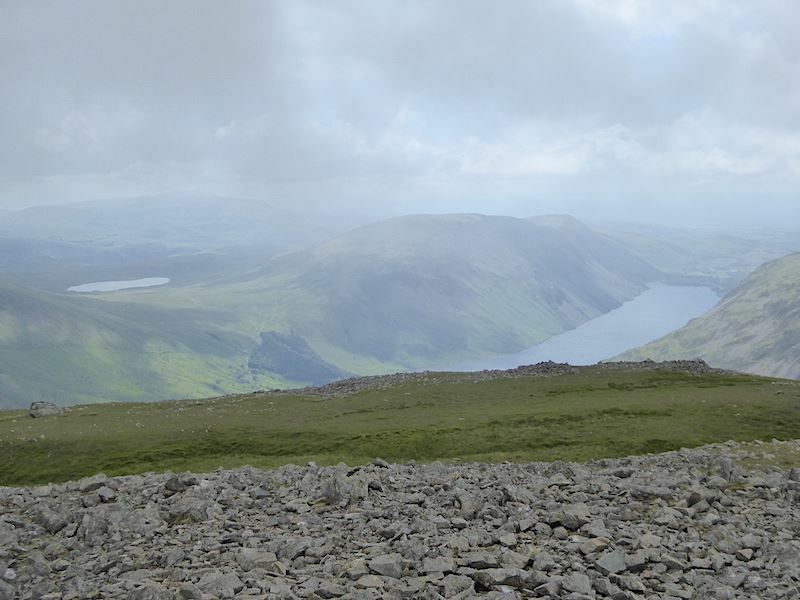 Directly below us is Wast Water, on the left hand side is Burnmoor Tarn and between the two are the huge bulks of Illgill Head, at this end, with Whin Rigg at the far end. 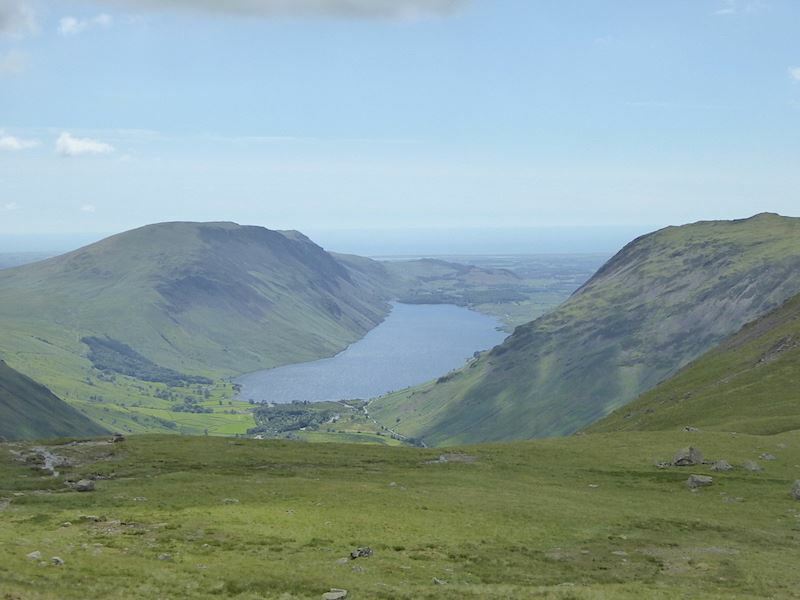 Over to the right of Wast Water and through the cloud we can see Yewbarrow, on the left, Seatallan, on the centre skyline, and Red Pike (the Wasdale one) over on the right. 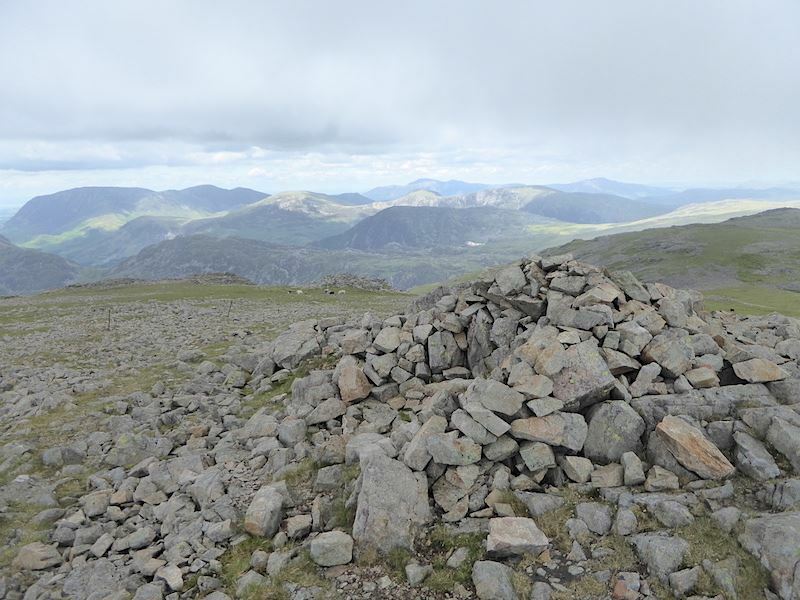 A view to the west from the cairn on the south top with many of the fell tops greyed out by the cloud. 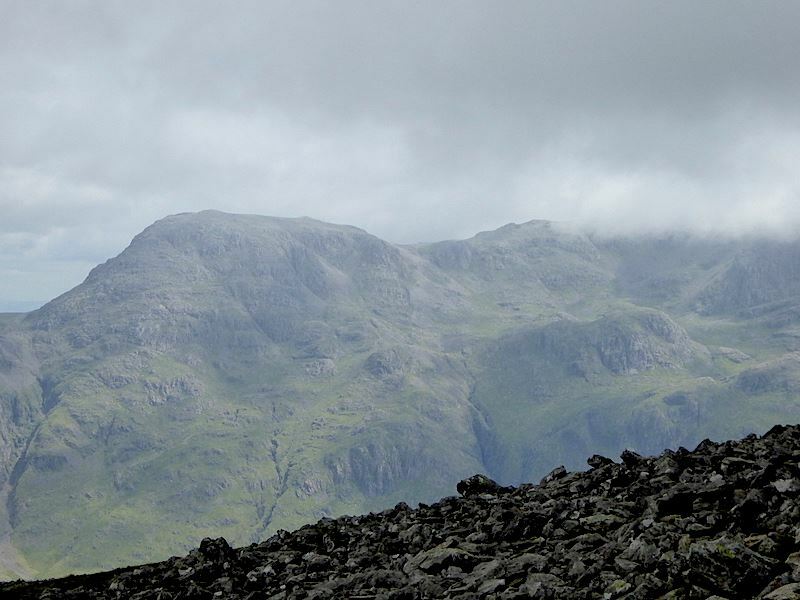 Over to our left we have a decent view of Great End but the tops of the Scafell group stubbornly remained hidden by the low cloud. I did wait a while but I knew it wasn’t going to happen so I can’t show you them today. The cloud base was low enough to envelop Great Gable too but at least I did manage some cloud free shots earlier so I wasn’t too disappointed. 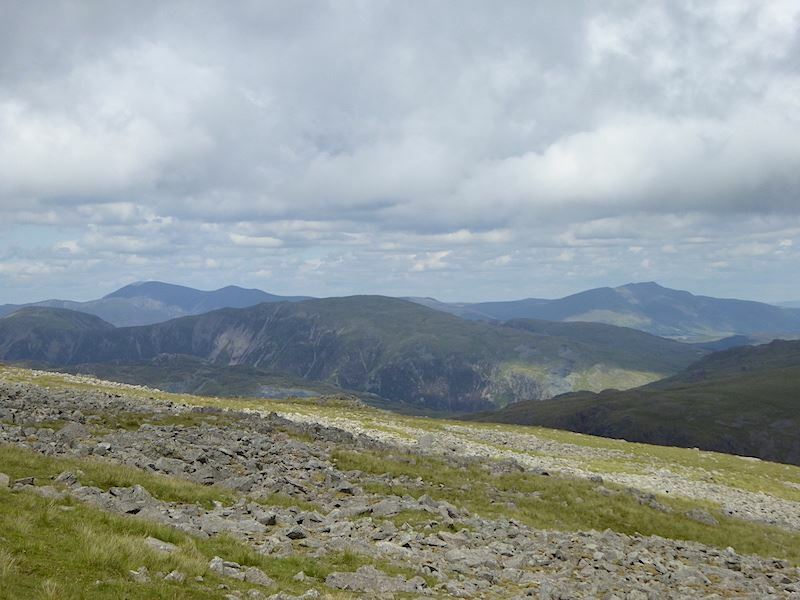 Looking across to the west with Blencathra on the right of the skyline …..
….. while over in the east we can see Clough Head, The Dodds and the Helvellyn range beyond the dip of Gillercomb Head. 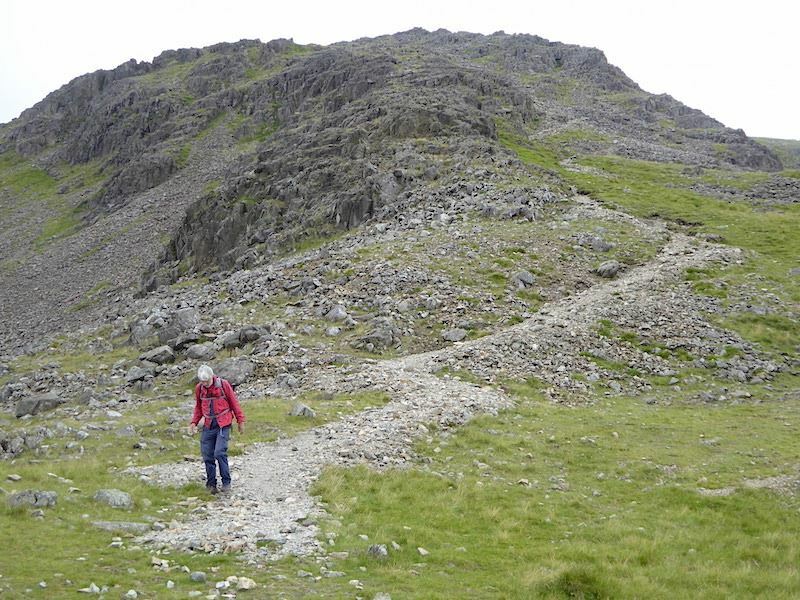 What goes up must come down and so we make the steep and slithery descent back down to Beck Head. 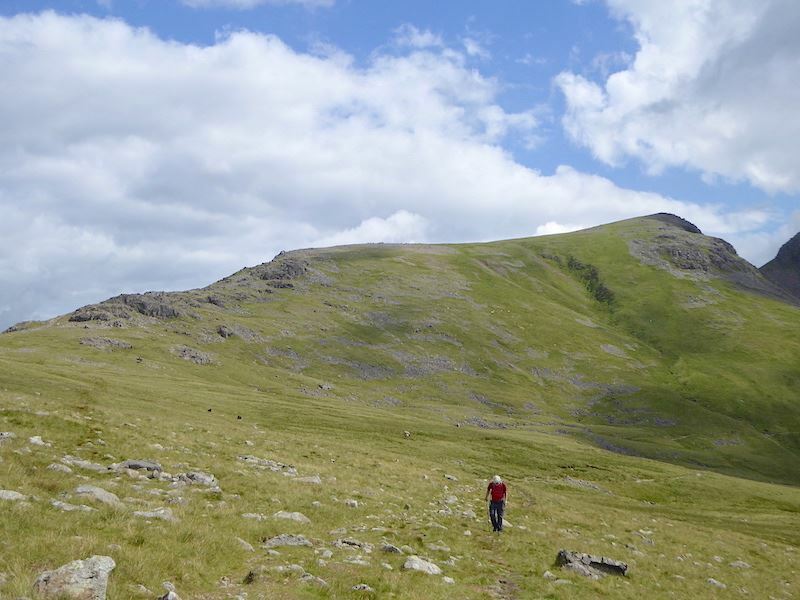 Cardiovascular exercise on the way up, musculoskeletal exercise on the way down is one way of looking at it I suppose, but right now we’re both thinking – flipping ‘eck (or words to that effect!). We make it down safely although the recuperating foot did not like it one bit and is letting that be known by beginning to ache. 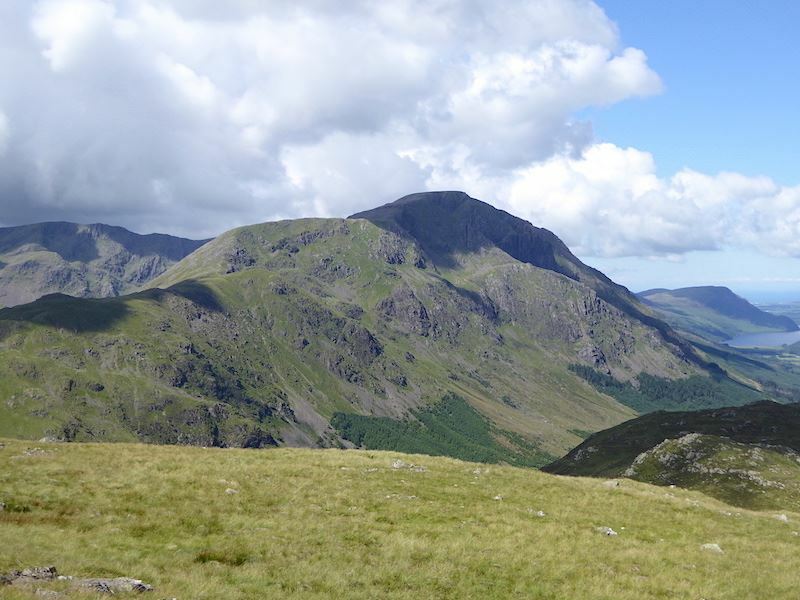 One more look back at Kirk Fell …..
….. and as we cross Beck Head one more look over to Wast Water. 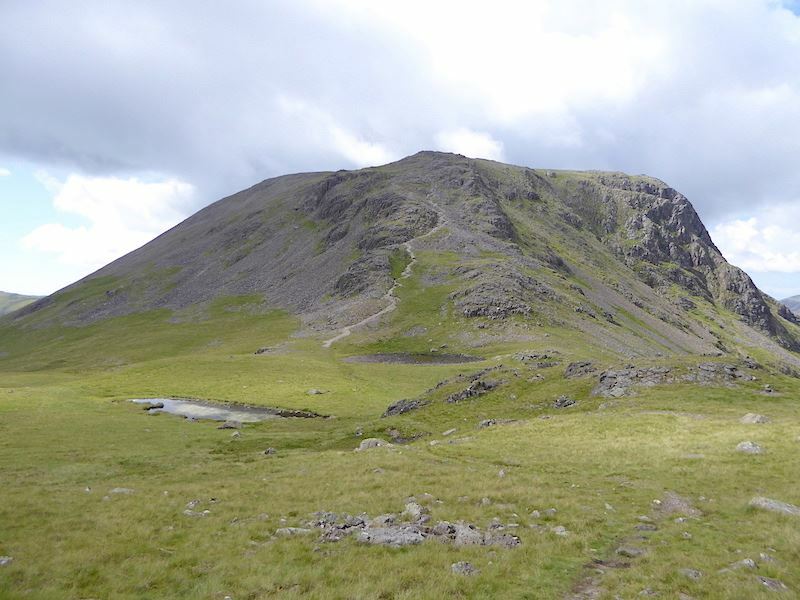 Making our way back over to the Windy Gap crossing and, with a splash of sunshine on it, a shot of Green Gable. 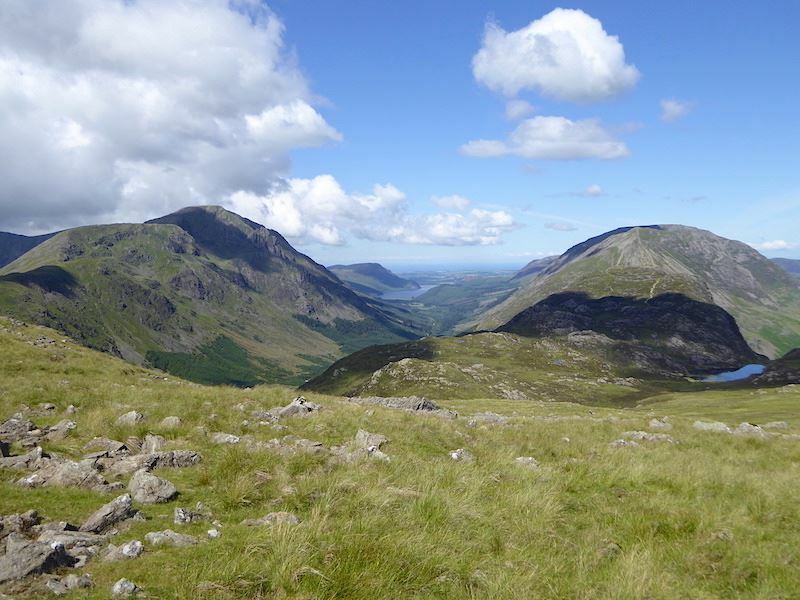 Another look at the view across Ennerdale still dappled by the cloud. 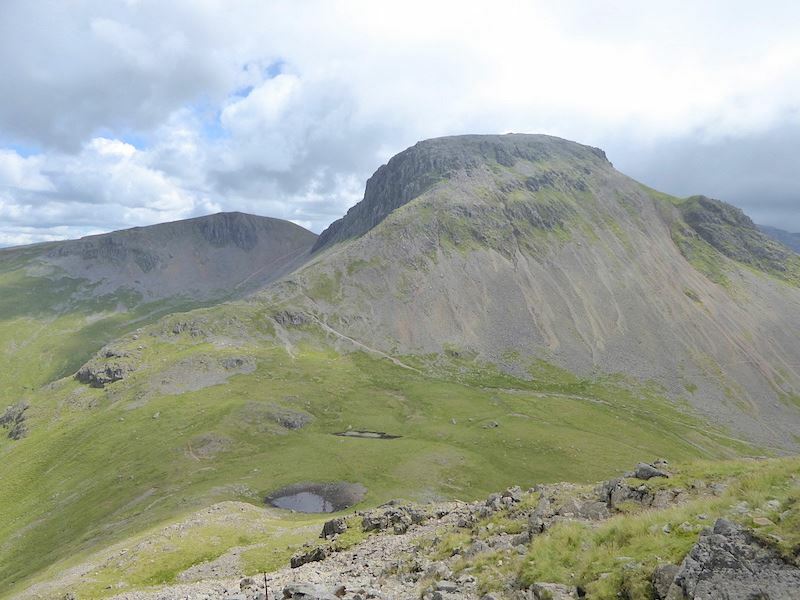 A look back at Great Gable crags as we make our way back along the path we used earlier. 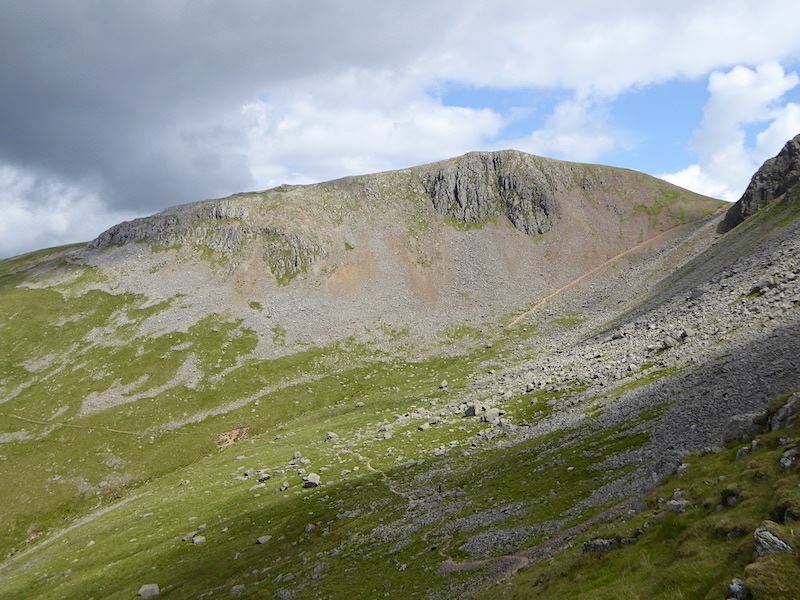 Green Gable gets its moment in the sun. 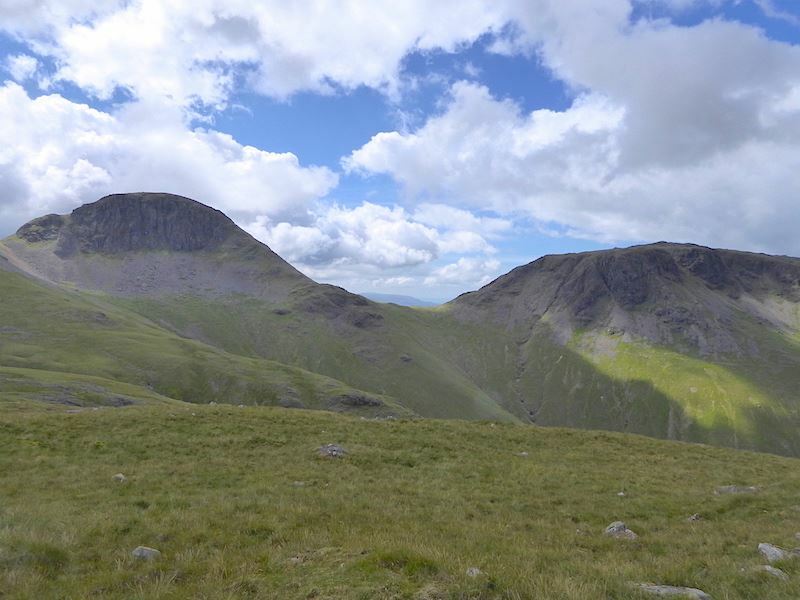 We had earlier considered returning over Brandreth and Grey Knotts but with the foot getting tired and aching a lot more by now we decided that subjecting it to more climbing probably wasn’t a good idea so we gave them both a miss today. 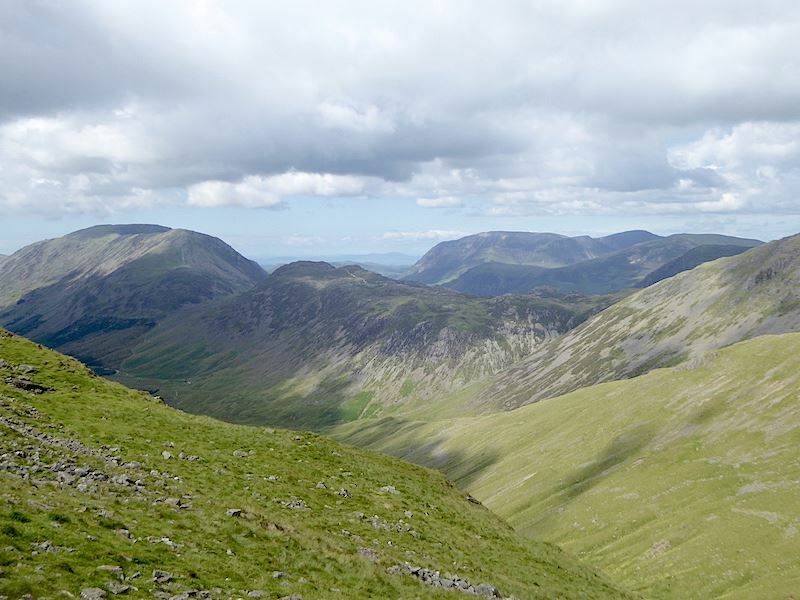 Over the stile and on towards Honister. 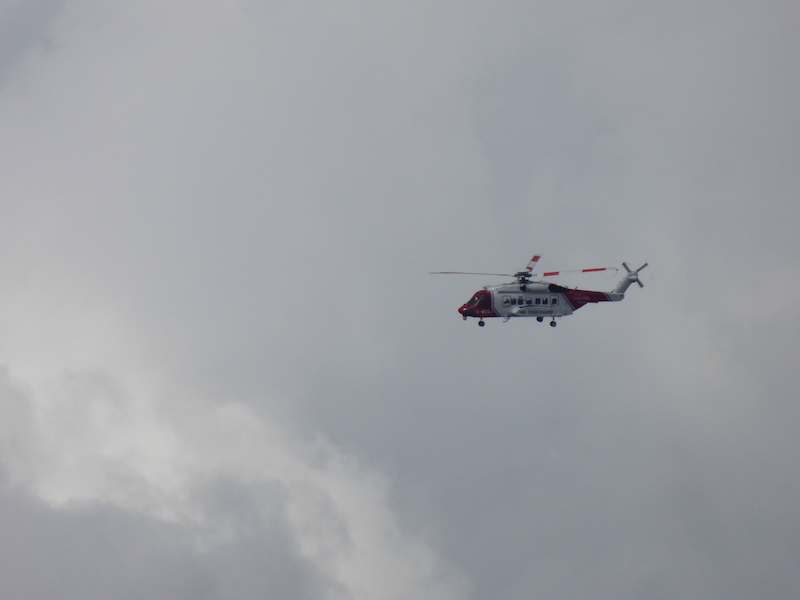 H.M. Coastguard’s helicopter flying around and keeping an eye on things. 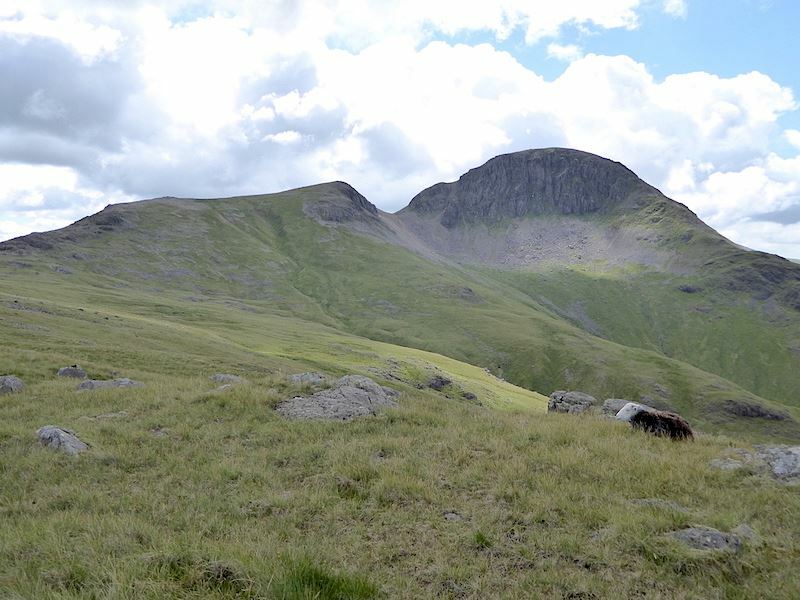 Grey Knotts briefly in the sun. 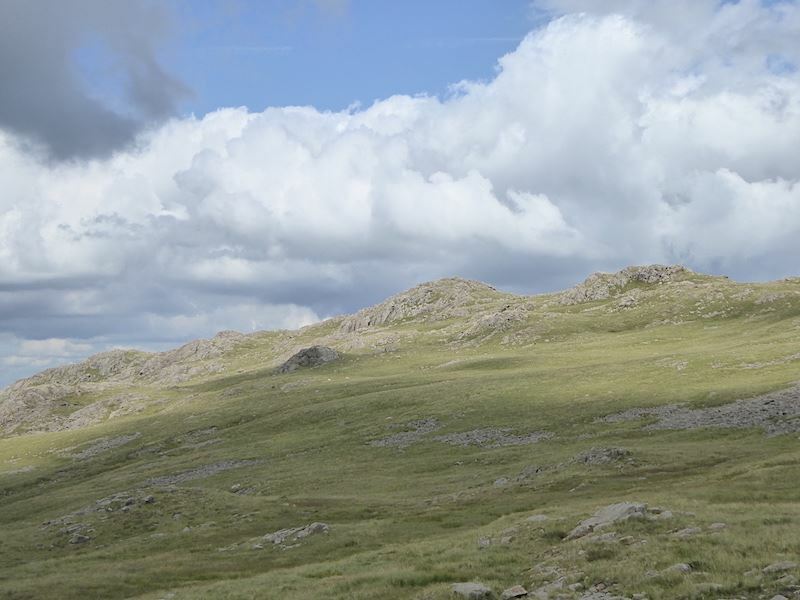 The cloud build up was considerable so sunny spells were very much on the brief side. 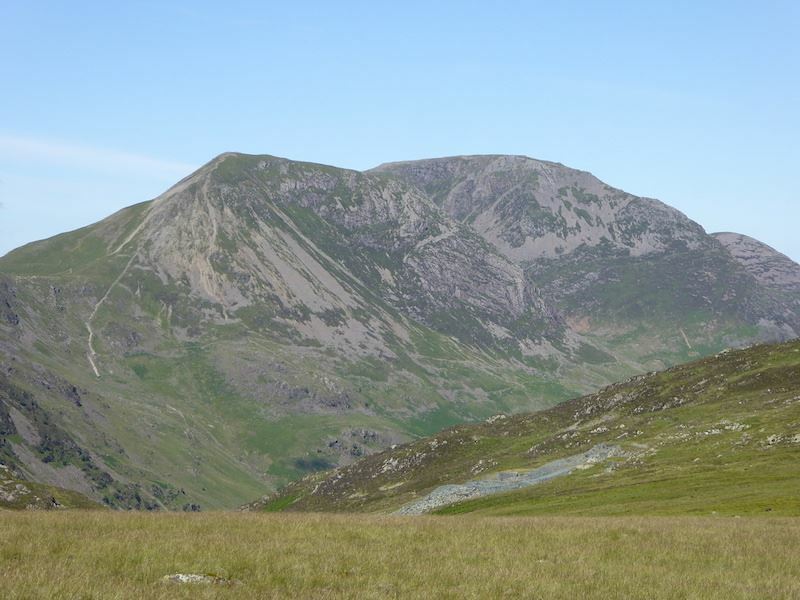 Over on Fleetwith Pike the mine’s spoil heaps get their moment in the sun too …..
….. as does Dubs Bottom. We’re very nearly back at the old winding house now, wonder how Mr Cafe Nero got on? Once down there the aching foot can relax in the comfort of the car while we reflect on a long walk but a very enjoyable one nevertheless despite the long lasting cloud on Kirk Fell summit. 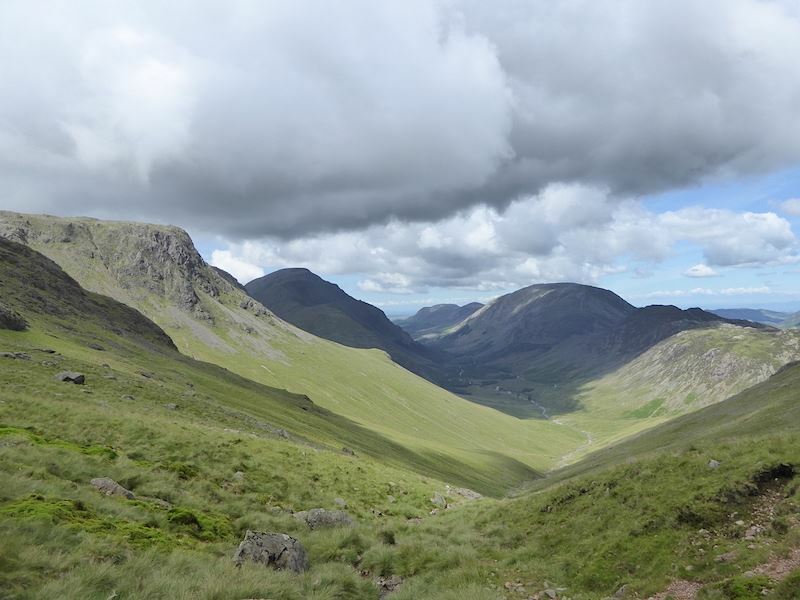 We never seem to be very lucky with views from the fells around Wast Water, even on a good day they often attract cloud cover and today was no different.